About What We Do Pies Let's Talk Say What? AboutWhat We DoPiesLet's Talk Say What? Pieman began baking pies back in 2011. We wanted to bring a quality product to market using fresh ingredients and local suppliers. 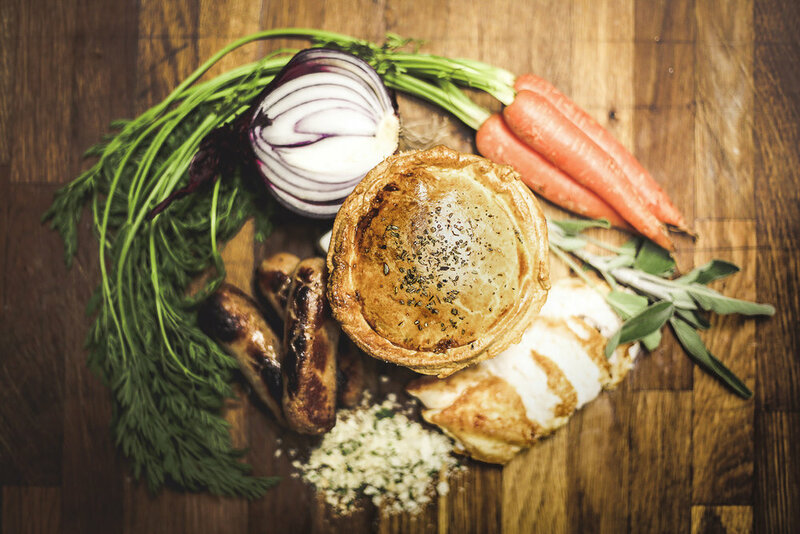 Each pie is made with love in our kitchen in Dublin, filled to the brim with meat, veg, fresh herbs and delicious pastry. We started with The Pieman Café, now open seven days, we hit up festivals and trade-shows and our artisan products are stocked in some of Ireland's favourite venues. We love any opportunity to get our pies to the people. The Pieman Café is in 14a Crown Alley, Dublin, serving delicious pies, infamous sausage rolls, homemade cakes and desserts, fresh roast coffee and craft beer. We're open seven days a week to make sure passers-by are pie-fed round the clock. We go to markets and festivals throughout the year as well as supplying pies for private events and weddings. Yes! The pieman wedding cake DOES exist... Keep up to date on our social media to find out where you might meet the Pieman next! Our tasty produce is available wholesale too, with our stock making an appearance in some premium venues across Dublin including the Light House Cinema and the Teeling Whiskey Distillery. Our small batch artisan products include pies, sausage rolls, soups, stews and salads, and are ideal for the busy kitchen looking to save on production and reduce wastage. We deliver to your door too, which helps. For more about our wholesale range, don't hesitate to get in touch. There are pie specials running all year round in our Café along with our sausage rolls, a range of soups, salads and treats. Thank you for getting in touch, we will respond as soon as we get a chance. Whether you've experienced our pies at The Pieman Café or on-location, we absolutely love hearing from you. Jump on to Facebook or TripAdvisor and let us know how it tasted! "Amazing pies and the best, most genuine customer service I've ever received, thank you so much will be back again, highly recommended." "SUCH a delicious place! Options for everyone, including vegetarian. I could eat here every day! An easy walk from all hotels in the Temple Bar area. A must try! Reasonably priced as well!" "F**kin' amazin' pies. And beers. And People." Copyright The Pieman 2017. All Rights Reserved.